SanTan Village is an outdoor shopping. entertainment and dining destination in Gilbert, Arizona. Gilbert is in the East Valley. 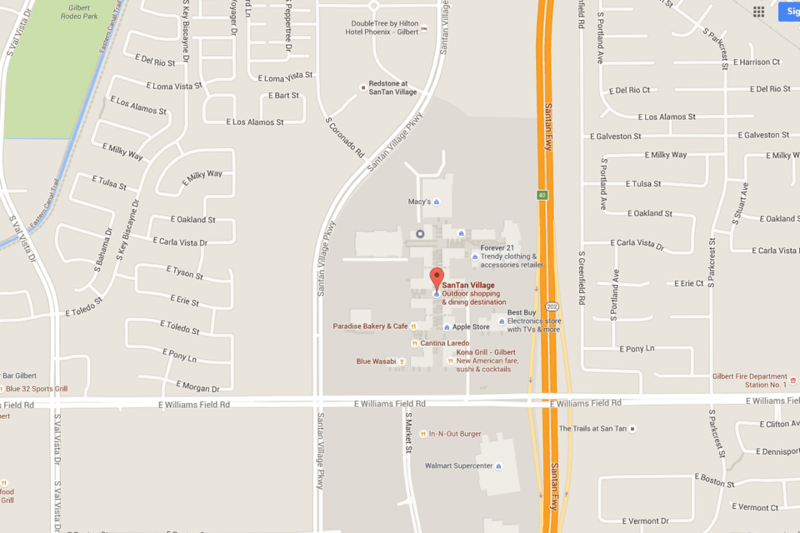 SanTan Village -- that's not a typo; there is no space between San and Tan! -- is located at the intersection of Williams Field Road and the Loop 202 Freeway (San Tan). In addition to the wide variety of shopping opportunities there, you'll also find an Apple Store as well as Harkins Movie Theatres and a free splash pad for some wet, summer fun. Looking for restaurants? There are many from which to choose here! There is free WiFi in the Garden Courtyard and a children's play area near Dillard's. On the perimeter of the outdoor shopping mall you'll find a Walmart and a Sam's Club, right next to each other, just south of Williams Field Road. A Costco store and a WinCo Foods are right down the street, making this section a big-box shopping extravaganza! Be prepared to walk! While this is an open-air mall, it is hot here in the summer, even in the shade. Thankfully, the food court is indoors. From most points north and west: Take US 60 to the San Tan Fwy Loop 202 East. Exit Loop 202 at Williams Field Road. The SanTan Village shopping area is northwest of the intersection of Loop 202 and Williams Field Road. If you are coming from the south, you can get to Loop 202 Santan Freeway and take the Santan Village Exit 41, take a left turn to take Santan Village Parkway to Market Street, A right turn on Market Street will take you past a variety of restaurants that are on the perimeter of the shopping mall. Be careful when driving from other parts of the Valley to the Loop 202 -- there are two of them! Check out #6 on this list of Phoenix area driving tips. You are looking for the San Tan Freeway, not the Red Mountain Freeway. Read more about Gilbert, Arizona. See driving times and distances from various Greater Phoenix cities and towns to Gilbert.